All the information we have come from a copy of a 1975 brochure of an NBI Hantu (later renamed to the System II). It boasted an Intel 8008 processor up to 16K of RAM and two 8" 250K floppies. NBI was the first software based wordprocessing system on the market. At that time, the competition had to change firmware each time the program was changed. NBI officially stood for "Nothing But Intials", however the real origin of the name NBI was "Necton Bilinium Incorporated" a name chosen by one of the company founders - Binx Selsby. Thanks to Kenny Stamm for all this information. 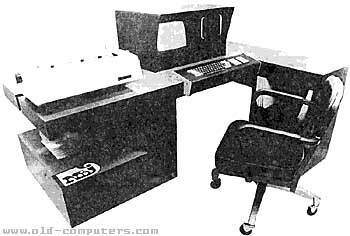 While working at Western Electric's Engineering Research Center in suburban Princeton, NJ, I had ordered a printer interface from NBI and Binx. We received an apparently handwrought circuit board, notable for two features. First was the layout of the individual components on the circuit board. Nothing was rectilinear or orthogonal, but parts were placed apparently haphazardly (possibly to minimize inter-electrode coupling (as in a 6AK5)? ), or just for satisfying 'style'. The other was a strain relief 'system' for the ribbon cable - a massive, twisted tapered blacksmith-fabricated wrought-iron piece was affixed to the circuit board with a hand-hammered copper rivet! Most striking! We all surmised that NBI was run out of a commune's tent! It DID work as advertised! Haven't seen it since the late 'seventies. see more NBI Hantu Ebay auctions !